Night meetings on the 4th Thursday of the odd numbered months (January, March, May, July, September and November) commencing at 7.30pm. Day meetings on the 4th Thursday of the even numbered months (February, April, June, August and October) commencing at 10.30am. No meeting in December. DAYBORO MARKETS - 1st Sunday of the month excluding January. Raising funds for local community and various charities. LIONS CLUB MOVIE NIGHTS - 3rd Saturday of the month excluding December. DAYBORO CONVERSATION CLUB - Fridays 10am-1.30pm. 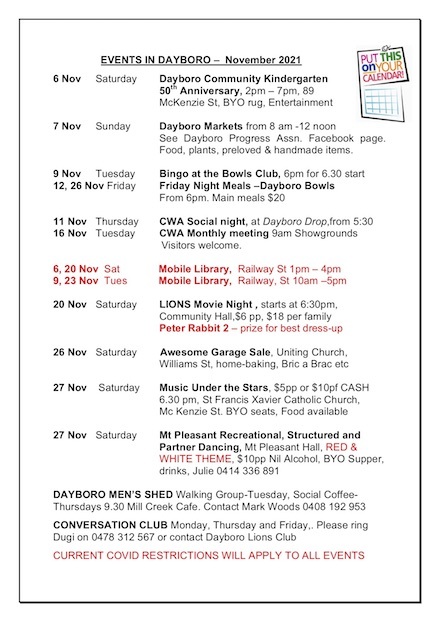 Dayboro Uniting Church, Wesley Mission and Dayboro Lions Club. Join us at Jack's Place, 135 McKenzie St, Dayboro and enjoy lots of discussion about music, food and travel and much laughter with old and new friends. All seniors from Dayboro and the immediate surrounding areas are welcome. No qualified medical staff are available. Members need to bring their own carer. Morning tea and a light lunch are provided. Click here for details about Entangle-living art Workshops in the beautiful Old Butter Factory in Dayboro.